It's 00:27 and I've literally just finished reading The Upside of Unrequited and I can tell you this: it had all the feels. My heart was crushed but it also soared because of how amazing Albertalli's writing is... Seventeen-year-old Molly Peskin-Suso knows all about unrequited love - she's lived through it twenty-six times. She crushes hard and crushes often, but always in secret. Because no matter how many times her twin sister, Cassie, tells her to woman up, Molly can't stomach the idea of rejection. So she's careful. Then a cute new girl enters Cassie's orbit, and for the first time ever, Molly's cynical twin is a lovesick mess. Luckily, Cassie's new girlfriend comes with a cute hipster boy sidekick. Will is funny, flirtatious, and just might be perfect crush material. Maybe more than crush material. And if Molly can win him over, she'll get her first kiss and she'll get her twin back. For me, the character of Molly is so relatable. When I was younger, I used to crush on so many people - just ask my best friend - I crushed on so so many people throughout high school, it was crazy. Unlike Molly, I have had long relationships but I could still relate to how Molly felt when she thought no one would want her because of her weight (I feel the exact same way), and I could relate to how Molly always felt left out when she was around other couples. For me, The Upside of Unrequited is on the same level as Simon v The Homo Sapiens Agenda and even thought SVTHSA had a better storyline, I feel like the diversity within TUOU put it on the same level as Albertalli's debut. At least 50% of the cast was diverse. There were lesbian Moms, Cassie who is a lesbian, Molly who is heterosexual, Mina who is pansexual and Korean-American, black side characters, Jewish main characters, a main character that suffers from anxiety, and white characters. I mean, how awesome is that diversity? Sure, the main character - Molly - is heterosexual, but she's described as overweight which challenges other young adult books where the female protagonist is always described as gorgeous. "When you spend so much time just intensely wanting something, and then you actually get the thing? It's magic." What was also amazing about this book was that it was around the time when gay marriage was legalised in the U.S.A and I loved it when Nadine drove Molly to the White House to see the building lit up in the LGBT flag. I thought it was such an amazing moment. And I also loved how we witnessed a lesbian wedding as that is something that we never see within young adult books. Another thing that I absolutely loved was that when given the opportunity *slight spoiler ahead* Molly didn't choose the 'attractive hipster guy', she chose the geeky, slight overweight Reid and she defied all expectations. She chose someone who made her feel comfortable with herself and who made her laugh - which I think is really important. I know that I've just rambled on about the diversity within the book but please, how could I not? It was amazing to see this kind of representation in a YA book. I also loved the sisterly relationship between Cassie and Molly. Even though there is seven years difference between my sister and me, I could still relate to the turmoil that Cassie and Molly went through and I recognised a few of the arguments that they had. It was nice to see a sister relationship development arc be one of the main elements of a book instead boys being the main focus. 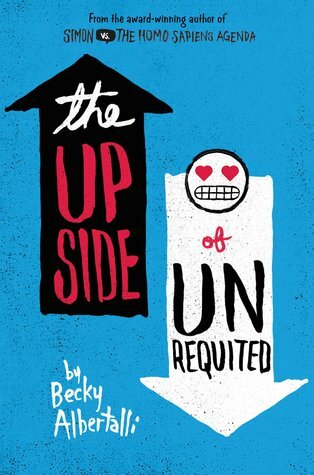 Overall, this book was amazing and considering that they're doing a film of Simon v The Homo Sapiens Agenda, I would love to see The Upside of Unrequited get a movie deal as well. I think it would be brilliant to bring the diversity to the big screen. Yet another fantastic book from Albertalli and I can't wait until she graces us with her next book. I'm eager for it already. Huge thanks to Kirsty of The Bibliophile Girl for this wonderful guest post. If you enjoyed this one then be sure to visit Kirsty's blog where you will find plenty more book reviews. You can follow her on Twitter, Facebook, Instagram and Bloglovin.